FishNet USA — May 9, 2014 — To equate what a recreational fisherman pays to catch a fish to what a commercial fisherman is paid to catch that same fish is to equate the total cost an equestrian pays to ride her horse for a mile to what Amtrak would charge to move her the same distance on a train. The Gulf of Mexico/South Atlantic shrimp fisheries provide another example of how closely intertwined commercial shellfish fisheries and commercial/recreational finfish fisheries are. Domestic shrimp fishermen exert a tremendous effort – at a tremendous expense – to avoid bycatch of juvenile stages of important finfish species, particularly snapper and grouper. 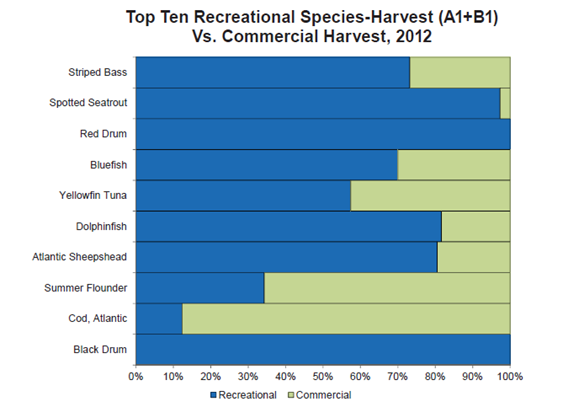 The Mid-Atlantic/New England squid fishery is managed in large part for the butterfish bycatch (more on butterfish later). And there are similar finfish interactions in other shellfish fisheries. 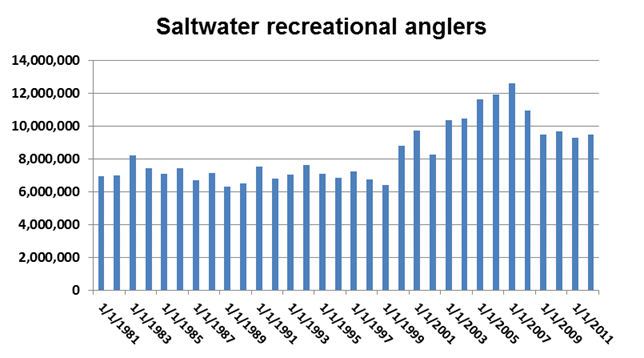 As the chart below (from NOAA/NMFS) shows, the number of saltw ater recreational anglers, which remained reasonably stable for the last two decades of the twentieth century, grew significantly in most of the first decade of the twenty-first, until the “Great Recession” began. Whether most of those who left come back to the sport or not, there are and will continue to be millions more than there were a decade ago while the productive capacity of our waters isn’t going to increase significantly. 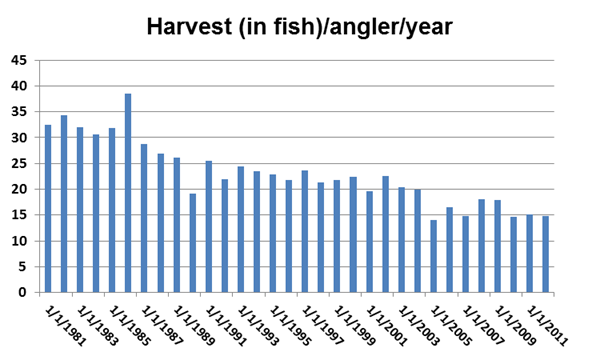 A recent NOAA/NMFS publication (Fish Assessment Report – Fiscal Year 2014 Quarter 2 Update available here) reported that only 59.6% of the fish stocks listed on that agency’s Fish Stock Sustainability index had “adequate” assessments (from NOAA/NMFS “generally a minimally adequate assessment can be conducted where there is good information on the level of annual catch and an indicator of the degree of change in stock abundance over time”). Over 40% of our important fish stocks do not. What that means is that, because of the precautionary principle the harvest of almost half of our important fish stocks are too low because we don’t know enough about them because the science isn’t there to adequately assess them.